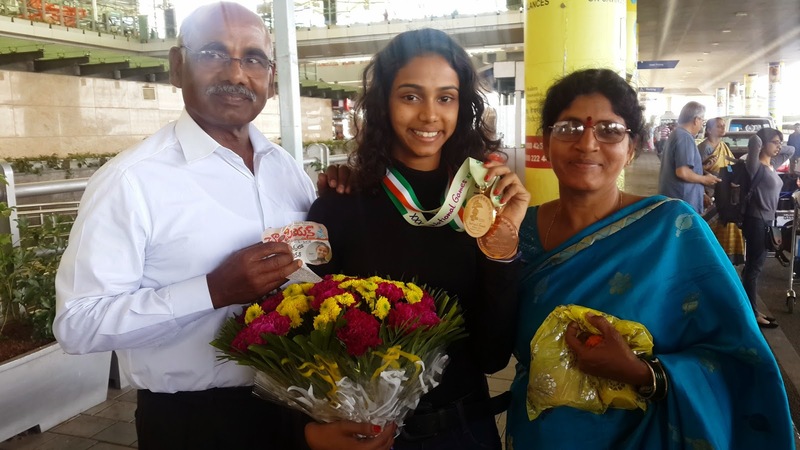 Let me take you through my journey to 1 GOLD and 1 Bronze medal. My Feeling : I was pretty confident to begin my competitions. 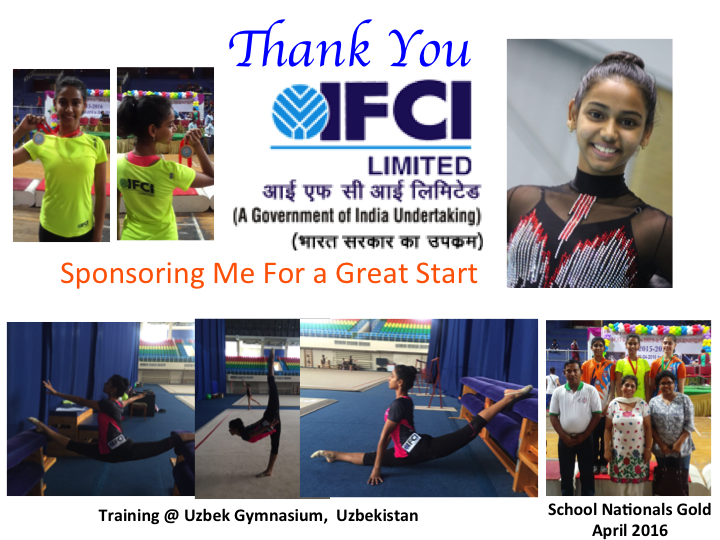 I had a lot of support from my team mates who encouraged to build confidence. The previous day the organizers divided the states into Section A & B. I was in Section A who were supposed to perform in the morning session. The order of performance was also given to us. I was performing Hoop at 6th, Ball at 1st and Clubs at 1st. Unfortunately, I did not get the opportunity to perform Ribbon as we were 4 team members and allowed to perform total of 10 routines. 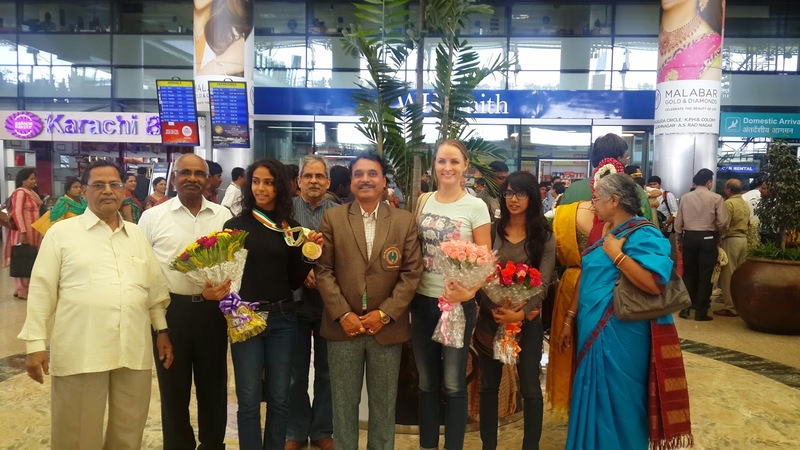 On the day of the competition the Andhra Pradesh(AP) team arrived only 20 minutes before the reporting time. Due to this I did not have the time to get my makeup done properly and also not enough time to warm-up. I could not take part in the march since I was warming-up. We were given a time of 5 minutes for the podium training after which our 1st apparatus was checked to see if it was according to regulations. Since I was 6th to perform, I went back into the warm-up hall to practice. However, I was called to perform 5th due to some changes. My overall performance was okay with very minor mistakes. After all the performances of participants, I was qualified to play finals. 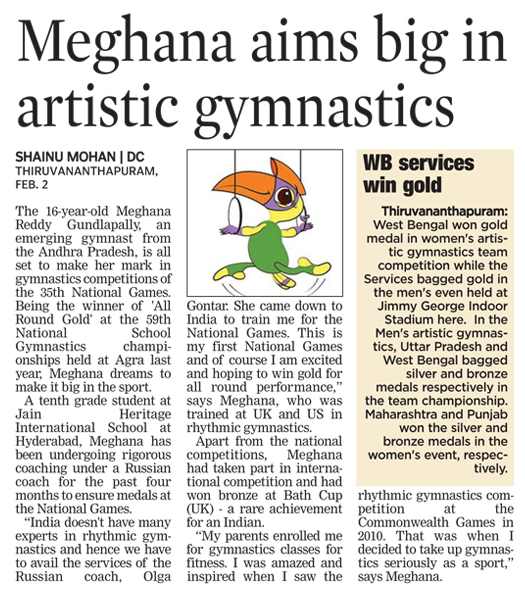 These competitions were also considered for the Team Championships and as a state team - AP we finished 5th after Delhi. Today we had the all round competition in which only the top 8 players could perform from previous day. 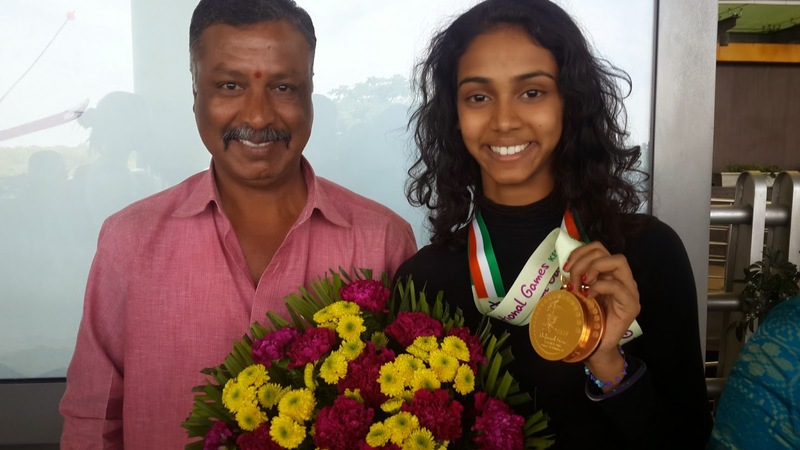 The sequence of this competition was decided based on the places which the athlete secured the previous day. The sequence of apparatus performed Hoop, Ball, Clubs & Ribbon. The biggest strength in this competition was the choreography of my routines. This would add a lot of value for my execution points. My First apparatus was hoop - The performance was much better than the first day. I did not repeat the mistakes that I made on the first day. I got the best score out of all my apparatus in this All-Round Competition. Ball - I was second to perform in this apparatus. Therefore, I did not go to the warm-up hall after podium training. This was also better than the previous day. Clubs - This is my favorite apparatus. I did good on the performance. Ribbon - The most unique thing about my Ribbon routine is its music and composition. During podium training my ribbon hook broke and I had to borrow and replace, due to this I did not had enough time to practice before my competition :( . I was able to perform well in spite of this. With all the performances over, I got the 3rd position to win Bronze and missing my Silver with 0.1 difference. In a competition every nano second makes a difference so as the points. How did I feel after the performance : I was really overwhelmed when mom called me and informed the ranking. I did not think about the next day as I was tired by then and wanting to rest to start the next day more stronger. Today the reporting time was 10 am in the morning therefore we arrived by 930 am, finished my warm-up and makeup. 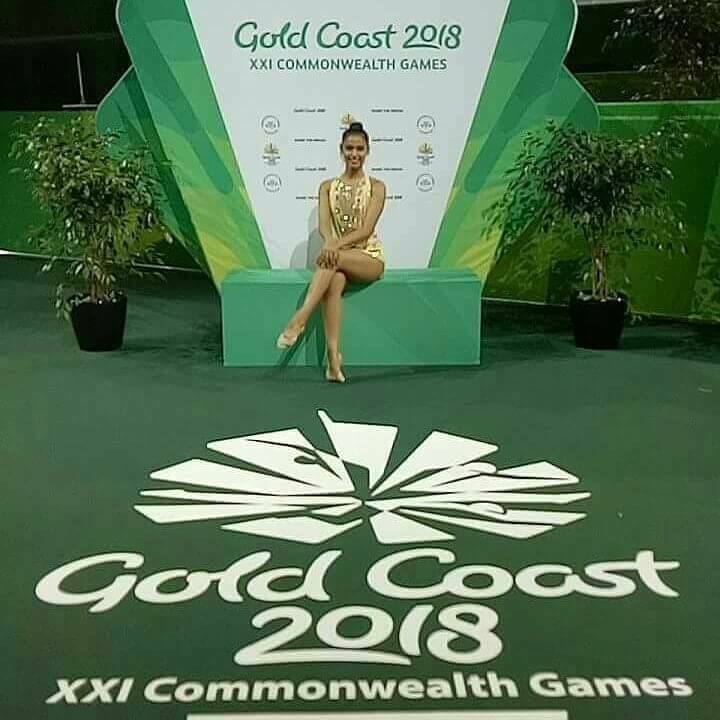 Unfortunately, I had a severe back pain for which I had to take pain killers before changing into my leotard after consulting the medical team at the stadium. On the first day I performed only three apparatus therefore, even today I was qualified to perform only three. 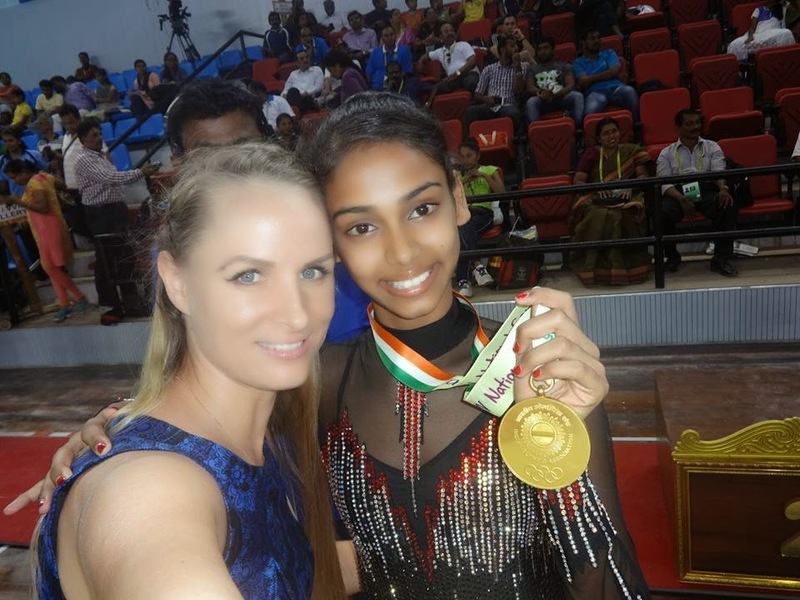 I was happy that my coach Olga Gontar , was there with me throughout the competition, she kept me firm and strong all through. HOOP : Since there were only 8 athletes compete for each apparatus, I could not go to the warm-up hall after podium training. During podium training I did my whole routine twice. For me to report to the mat I was escorted by a volunteer holding the name of my state. 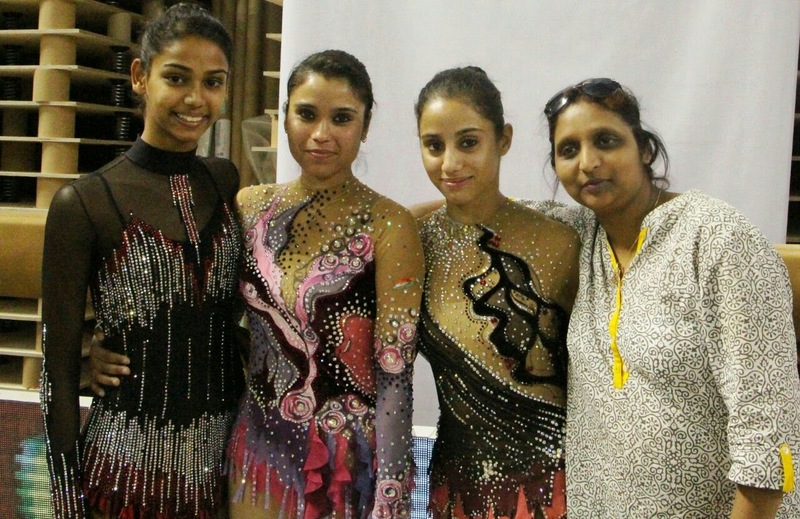 I was happy with the overall performance and did not make any mistakes and the routine came out well. The organizers placed two chairs next to the mat so that we athletes and our coaches could sit and wait for the difficulty scores to be announced. BALL : For the podium training I did the routine twice again and practiced all my throws. During the competition I felt Déjà vu since I was doing the same performances for the past three days. I really liked the Ball routine since the composition was the most beautiful , i ever had ,if it was not olga ,my routine would have never been so different . 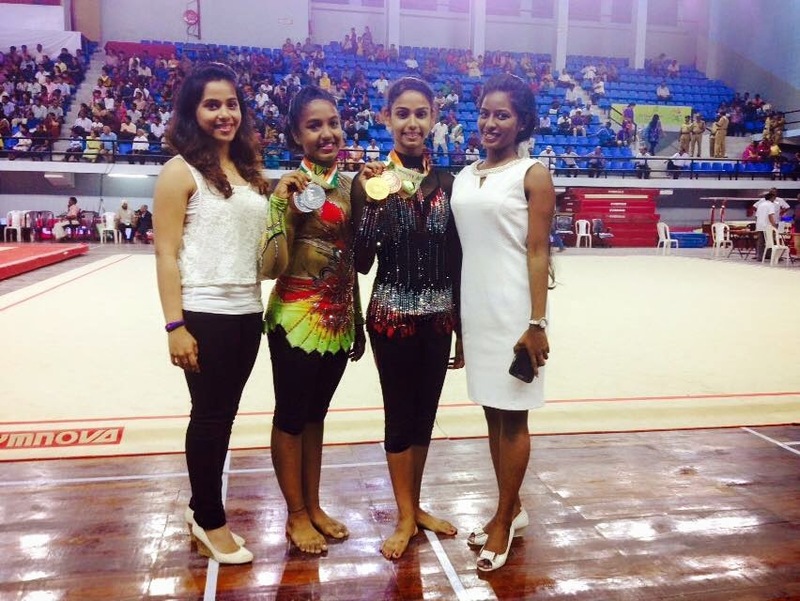 Before the next apparatus we had medal ceremony for Mens Artistic & Women Artistic Gymnastics. 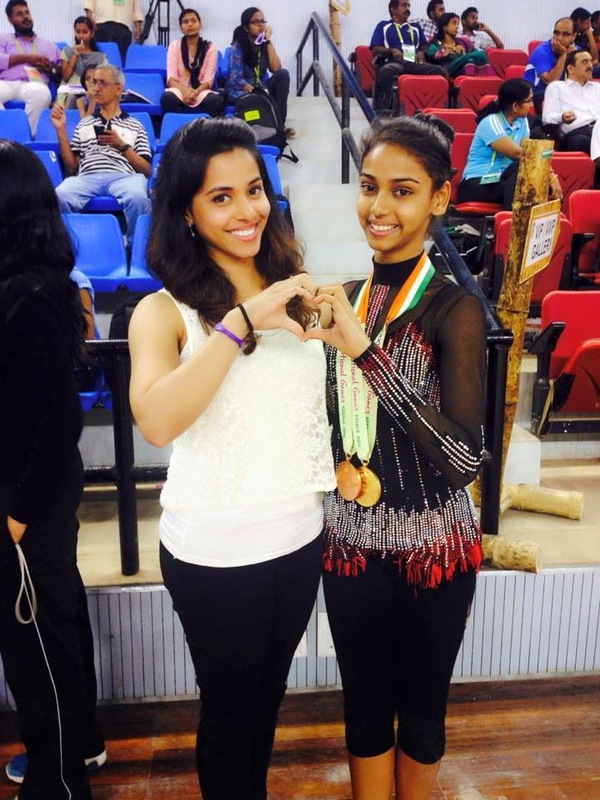 Dipa Karmakar got the Gold, Pranti Nayak - Silver and Pranati Das - Bronze in all round championship. 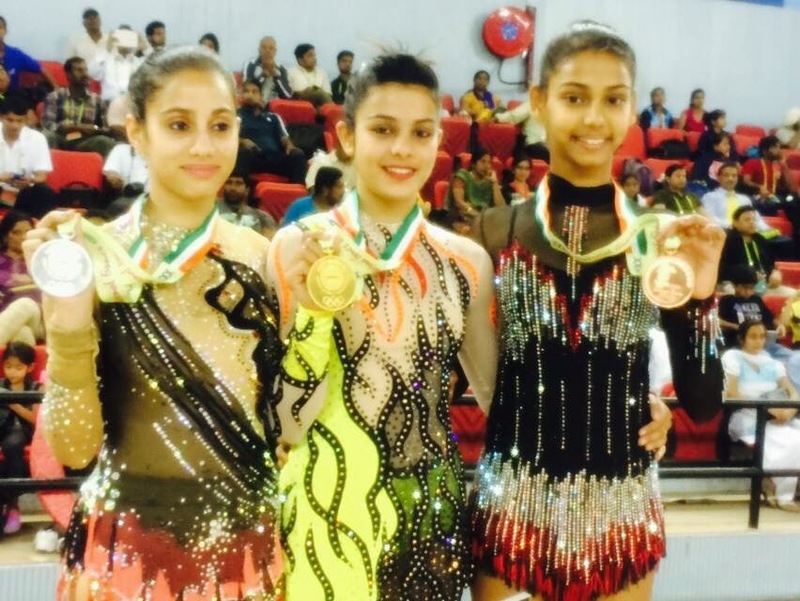 In the Mens Artistic where Rakesh Kumar Patra - Gold, Ashish Kumar - Silver and M Sinoj - Bronze. I was so happy to meet all of those, who are the best gymnasts in the country. CLUBS : This was the third and last performance for me. As it was the last performance I preserved all my energies for the last apparatus. I thought for myself that I have been doing these for many times in the past two days and that I could make it better than the last two times. I did not make even a single fault this time and I made sure that my body did not relax until the I got off the carpet. I made sure that all my apparatus handling were correct. I was over joyed that I finished my competition with an amazing routine. in this apparatus. That same day evening the final scores were announce and I was adjudged as the Best in Clubs winning Gold. 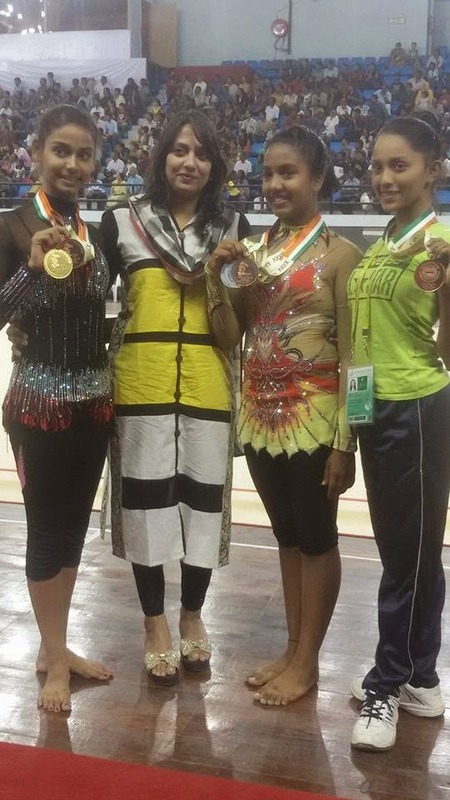 The medal ceremony for Rhythmic Gymnastics was held on the same day in the evening. 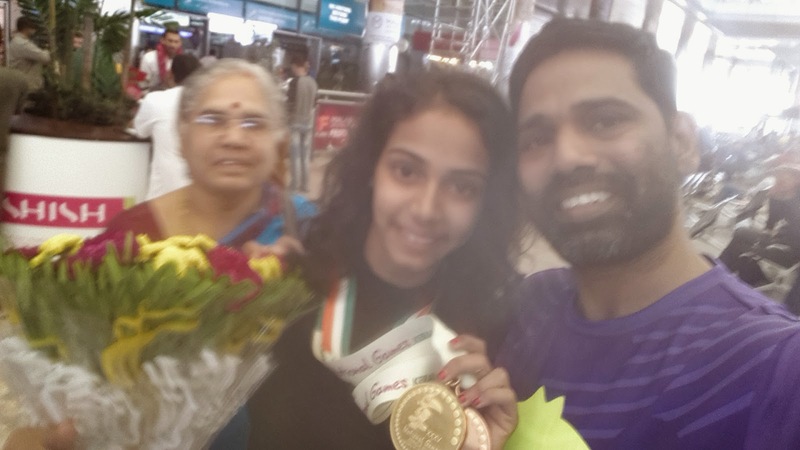 I was elated on receiving the GOLD Medal along with my proud Coach Olga Gontar and my mom at the stadium. After the medal ceremony there were number of reporters taking the interview of Olga and myself. We got loads of pictures to capture our memories. 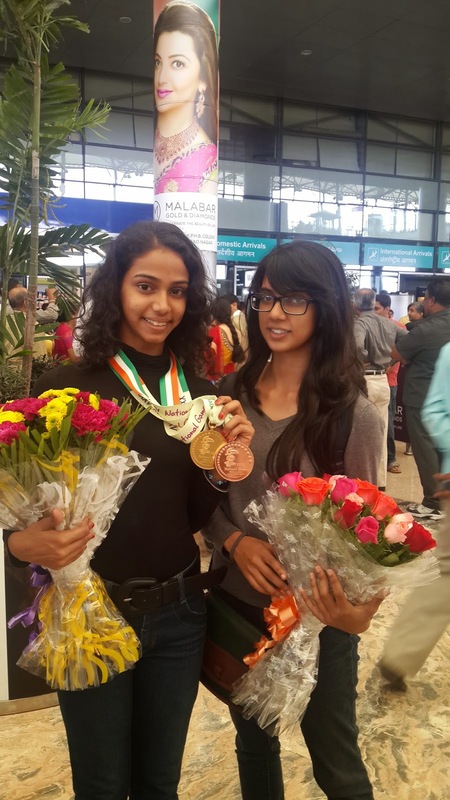 Happy for Aruna : On the same day were the competitions for WAG in the events of Vault & Uneven Bars. On 6th February the Floor and Beam was held for WAG. 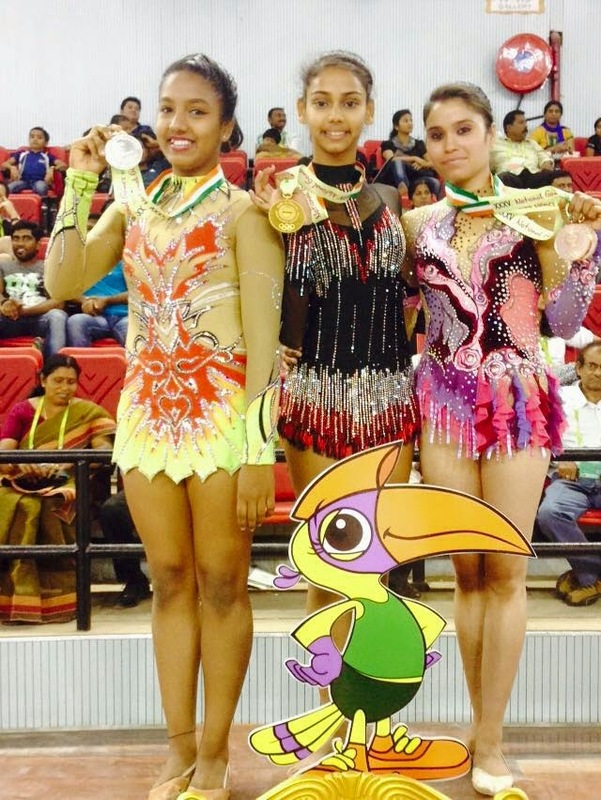 In these competition Aruna Budda Reddy from AP secured a Bronze in Vault and Silver on Floor. i am so lucky to have her in my life ,the most amazing gymnast with so much self confidence and strength. 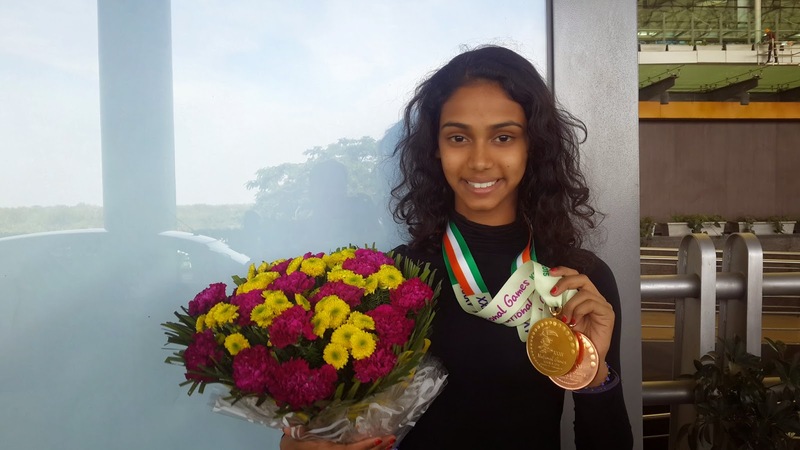 Day 8 : Friday : On 6th February the AP team along with Pranati Nayak, Dipa Karmakar went to the beach to enjoy ourselves on finishing the competition with good performances. 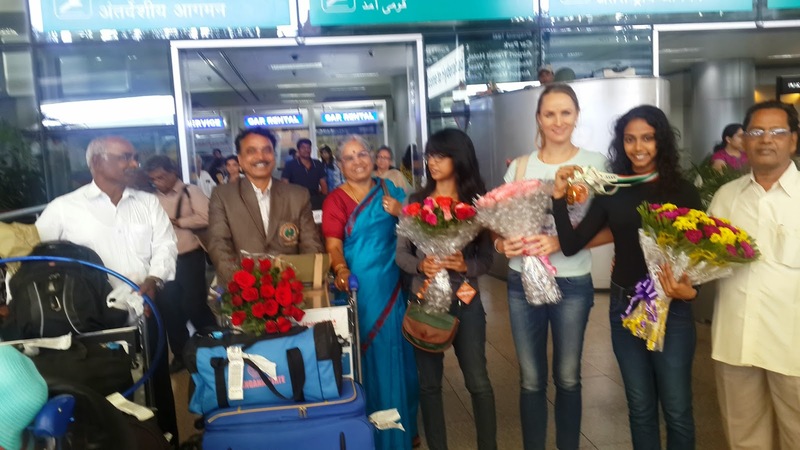 I started early in the morning at 5;30 am along with the AP team and drop them off at the Railway Station and headed to the hotel where mom and olga were staying. Later on at the airport we were joined by Natasha and her Dad. 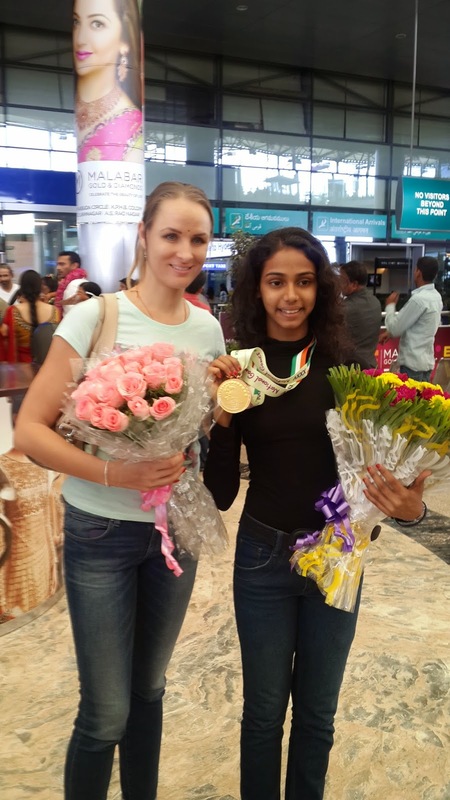 We also met Varsha Tai and Sanjeevani Tai at the airport.and also rohit jaswal bhaya, Our flight was to Hyderabad via Chennai. 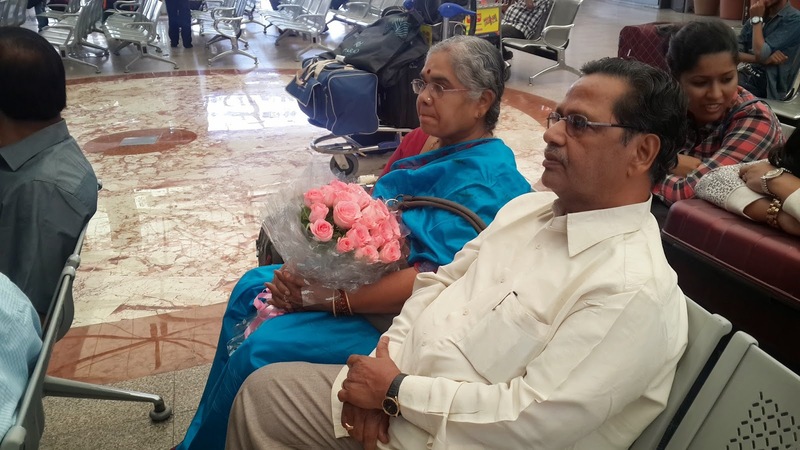 On arrival at the Hyderabad International Airport we were welcomed by our Family with Flower Bouquets. To make sure , to be ahead of the scheduled time at the venue of the competition. This would help in preparing well without rushing. By looking at the other Gymnasts I learned a lot about being in the spirit of sport.